The closing epic “Where Dreams Have Died” from Paradigms is on the covermount CD of the latest PROG Magazine (Issue 95). PROG also published a review of the album in the same issue. 2018 was a flourishing year, with a plethora of amazing records in the prog rock and prog metal genre. Today, I’m extremely honored to announce that “Paradigms” was named Instrumental Prog-Metal Album of the Year on Sonic Perspectives. Heartfelt thanks to Austin Kokel and Joel Barrios. I will be on the featured album of the week show of Progrock.com with ‘Paradigms’ on Friday January 11 (7pm UK time, 2pm EST) with DJ Peter O’Neill. Come hang in the chatroom and ask me anything, and we’ll listen to a few tunes from Paradigms together www.progrock.com/chat. Here’s the review taken from the site, see English translation below. Voici la chronique de disque du tout nouveau Semantic Saturation paru il y a 3 mois! C’est dans le style prog metal que le montréalais Shant Hagopian nous propose son tout nouvel album! Tout nouveau projet pour le guitariste montréalais Shant Hagopian qui récidive avec un second opus qui se veut la suite logique de Solipsistic paru en 2012. C’est appuyé par le batteur Craig Blundell (Steven Wilson) et le bassiste suédois Kristoffer Gildenlow (Pain of Salvation) qu’il nous propose un album qui sonne en partie comme le précédent. Il expérimente aussi d’autres genres musicaux comme pour la pièce Empty Whisky Jar avec la chanteuse Houry Dora Apartian qui se veut dans les mêmes eaux que David Gilmour pour le feeling qui soit dit en passant, est l’une de ses influences à la guitare. Mirrors of Confusion, Carousel of Death et The Stranger from Andromeda tombent en terrain connu si vous avez écouté son album précédent Solipsistic. Vous ne serez pas dépaysés. Il démontre une grande maturité musicale avec la pièce Until we meet Again qui est très texturée et inspirée. Le claviériste Derek Sherinian fait aussi une apparition le temps d’une pièce intitulée Ulterior Harmony… un bon rappel à l’album précédent. Et à ne pas oublier la pièce fleuve Where Dreams Have died qui passe par toutes les ambiances avec ses moments planants mais aussi plus lourds. Paradigms se veut être un projet très abouti pour Shant Hagopian qui y démontre toute sa virtuosité, ses talents de compositeur et d’arrangeur. Une qualité que j’aime de Shant, c’est que même s’il est comparé à Petrucci, Steve Vai ou Joe Satriani, il n’a pas tendance à trop en faire dans ses solos de guitare… il sait doser et pour cette raison, ce tout nouvel opus est une réussite sur toute la ligne. Un album incontournable pour les amateurs du genre. Here is the record chronicle of the brand new Semantic Saturation published 3 months ago! It is in the prog metal style that the Montrealer Shant Hagopian offers us his brand new album! Brand new project for Montreal guitarist Shant Hagopian, who reoffends with a second opus that is the logical continuation of Solipsistic released in 2012. It is supported by drummer Craig Blundell (Steven Wilson) and Swedish bassist Kristoffer Gildenlow (Pain of Salvation) ) that he offers us an album that sounds in part like the previous one. He also experimented with other musical genres such as Empty Whiskey Jar with the singer Houry Dora Apartian who wants to be in the same waters as David Gilmour for the feeling that is, by the way, is one of his influences on the guitar . Mirrors of Confusion, Carousel of Death and The Stranger from Andromeda fall into familiar territory if you’ve listened to his previous album Solipsistic. You will not be homesick. He demonstrates a great musical maturity with the piece Until we meet Again which is very textured and inspired. Keyboardist Derek Sherinian also makes an appearance the time of a play entitled Ulterior Harmony … a good reminder to the previous album. And do not forget the play Where Dreams Have died that goes through all the atmospheres with its hovering moments but also heavier. Paradigms wants to be a very successful project for Shant Hagopian who demonstrates all his virtuosity, his talents as a composer and arranger. 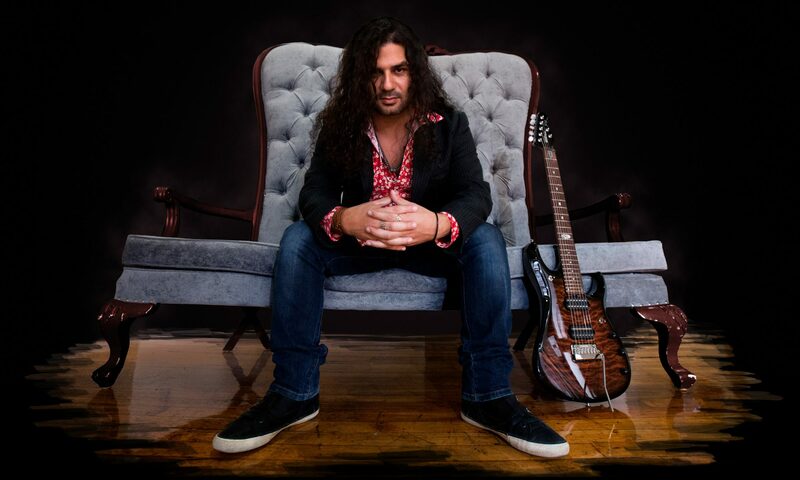 A quality that I love about Shant is that even if he’s compared to Petrucci, Steve Vai or Joe Satriani, he does not tend to overdo it in his guitar solos … he knows how to dose and for this reason, this brand new album is a success on the whole line. An essential album for fans of the genre. Pedro Bekkers wrote a review for Paradigms on Background Magazine. When I got to listen to Shant Hagopian’s second Semantic Saturation album; Paradigms I realized it was in 2012 that fell in love with Shant’s beautiful melodies and wonderful playing. Solipsistic (see review) became one of those albums that I came to play on a regular base, it never gets dull and remains an interesting musical journey, even after six years. In 2018 the time was right to release a new album and this time the accompanying musicians are as impressive as on the previous album. Besides Shant Hagopian, the core of the “band” are drummer Craig Blundell, well known from bands like Frost*, Lonely Robot and Steven Wilson. The Dutch/Swedish bass player Kristoffer Gildenlöw is famous for his participation in Pain Of Salvation, his solo works and is a member of the symphonic, progressive rock band Kayak. Guest keyboard players are the returning Derek Sherinian (Sons Of Apollo and many more) and Alex Argento (Icefish) who also produced the album. Where on the previous album Vanden Plas vocalist Andy Kuntz provided the vocals for one song, the sole vocal laden track on Paradigms sees Houry Dora Apartian as vocalist. Finally, Squiggy McFlannel is mentioned as trumpeter for on song. All in all a line-up that stands for high quality musical craftsmanship, and indeed these thorough musicians are very able to take the quite impressive compositions to an even higher level. Musically there is a lot of diversity on the album; guitar driven compositions, where Shant lets his guitar do the talking. He is able to write melodic guitar lines that substitute lyrical parts on progressive rock albums, but also knows when to play heavy nasty riffs. Both opening tracks; Mirrors Of Confusion and Carousel Of Death are good examples for this approach. Even more intense is Pareidolia, a heavy romantic track with subtle Joe Satriani infulences. Empty Whisky Jar is the only vocal track on the album, smooth blues and jazz elements are blended to a delicate composition, where again the Satriani references are clear, but in a song that good old Joe would never come up with. Perhaps my favourite on the album is the heavy progressive rock/metal song The Stranger From Andromeda, a brilliant tune where the trio; Hagopian, Gildenlöw and Blundell show they really belong to the top musicians in the scene. Until We Meet Again is a solid ballad style composition, highlighting some fine bass playing and tender guitar parts, welded together by subtle drumming. Another intriguing piece of music. Derek Sherinian enters his signature playing to Ulterior Harmony, making this one a progressive rock song with a fusion touch, a kind of smoother and funkier Planet X I would say. Perhaps weird, but the song Disturbance Within gives me the feeling of post rock, especially in the guitar parts these elements are very noticeable; together with the rhythm section the combination of post a progressiveness results in a more than amazing composition. Another fine tune where Shant lets his guitar do the talking is Universal; a kind of classic rock meets prog is the result, including very fine piano parts. Could you refer to an instrumental song as an epic, if you can, Where Dreams Have Died is the absolute epic of the album, spheres and speed changes all over the place, but remaining brilliant for the full ten and a half minute. Another perfect track I guess. Paradigms is the second outing of Semantic Saturation and it’s equally impressive as the debut, I think the use of different musicians does give the album a more progressive touch than the previous album. Which I think will win many true progressive rock aficionados, where the fusion freaks will still have their share of interesting parts. For me, this is another musical highlight in my collection. Enter your email address to get notified when there's a new post on my blog.